July 25 (Sat. ): Kahuku Hongwanji, 7:30 p.m.
O-bon services will be held on Thursday, June 18 at 7 p.m., Saturday and Sunday, June 20 and 21 at 10 a.m. and Monday, June 22 at 7 p.m. 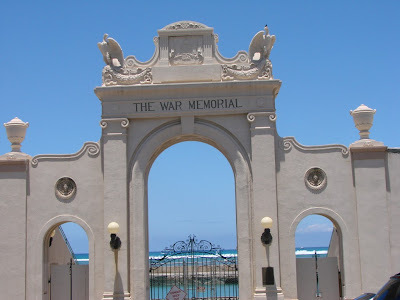 Here is a view of the Waikiki Natatorium War Memorial taken from across the beach. As you can see the bleachers have been completely refurbished. A lots of parts you can’t see in this picture though is falling apart and the pool remains closed. Sadly the fate of this memorial is up in the air as the city debates on whether to demolish the pool (read more here). For those interesting in saving this historic landmark you can sign a petition here. This is the entrance to the closed Waikiki Natatorium War Memorial. 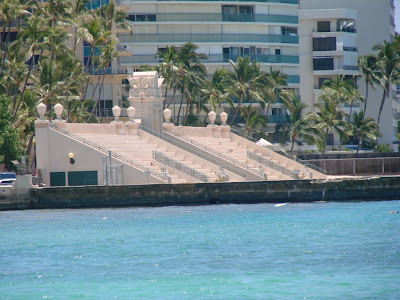 Opened on August 24, 1927, the birthday of Olympic Gold Medalist Duke Kahanamoku this structure and its saltwater swimming pool was built to honor the 101 who died and 10,000 who served in Wolrd War I from Hawaii. It is on both the National and State Registers of Historic Places but fell into disrepair. The state started restoration but ran into trouble with some department of health salt water pool rules halting construction. More tomorrow.